For important events in NIDA’s history, visit www.nih.gov/about/almanac/organization/NIDA.htm. Keeping an eye on drug use trends among teens to guide intervention strategies. Substance use among American youth is a continually changing phenomenon. Through its annual Monitoring the Future Survey of 8th, 10th, and 12th grade students nationwide, NIDA continues to monitor these changes and identify emerging substance use trends to better guide effective interventions. Identifying the molecular sites and systems in the brain where every major addictive drug has its effect. Such discoveries have led to the development and approval of nicotine replacement therapies for cigarette smoking cessation; new medications such as buprenorphine, which physicians now prescribe in office settings for opioid addiction; and nasal formulations of naloxone, which reverses opioid overdose. Studying the environmental, social, genetic, and biological factors that affect brain development. The NIDA-led Adolescent Brain Cognitive Development (ABCD) Study is the largest long-term study of brain development and child health in the United States. The study is following more than 11,000 healthy children from ages 9 to 10 into early adulthood to observe brain growth. Discovering a new communications network that opens the way to novel medical therapies. NIDA-supported research was pivotal to the discovery of a cannabinoid system throughout the brain and body that is composed of natural compounds chemically related to marijuana’s active ingredient. This network promises new and novel interventions for a range of diseases and conditions, including addiction, obesity, pain, and osteoporosis. Demonstrating that addiction is a treatable disorder. NIDA-funded research has demonstrated that medications and behavioral treatments can provide long-lasting benefits for people trying to overcome addiction and should include counseling when possible. Addiction treatment promotes continued abstinence, which can reverse some of the detrimental brain changes caused by addiction, as shown in pioneering imaging studies. Successful substance use disorder treatment also reduces crime and other societal costs, including health costs, now in the billions. Optimizing research findings to create individually tailored treatments. Researchers are taking advantage of ongoing discoveries from the Human Genome Project, identifying genetic markers of complex disorders such as addiction. Now, researchers are discovering gene variants that can predict who will respond to a medication and who will not. These breakthroughs herald a new era of individualized therapies that will optimize outcomes, promote cost efficiency, and relieve suffering. Decreasing the spread of HIV. Through the development of interventions and treatments for injection drug use (IDU), NIDA has contributed to the decline in IDU-associated HIV infections. Innovative community-based research shows that substance use disorder treatment reduces risk behaviors leading to HIV transmission; thus, substance use disorder treatment is HIV/AIDS prevention. Changing the course of substance use disorder treatment in this country. NIDA engages in myriad efforts to "translate" the results of basic and clinical research for real-world use. Our goal is to get research-based treatments into the hands of providers in community treatment centers, the criminal justice system, and physicians' offices. To that end, NIDA has established collaborative networks of researchers and practitioners, federal agencies, and state substance use directors to integrate research findings into substance use disorder treatment settings nationwide. National Advisory Council on Drug Abuse. Congress, under 42 U.S.C. 284a of the Public Health Service Act, requires that each NIH institute (including NIDA) have an advisory council that assists the institute in its efforts to identify, review, and support the highest caliber of scientific research. As part of its responsibilities, each advisory council participates in the grant review process for its institute, providing recommendations on which research applications will best advance the institute’s research goals and mission. NIDA's advisory council, the National Advisory Council on Drug Abuse, was established on January 3, 1973. It consists of 18 members: 12 scientific experts and six people from the general public who are leaders in the fields of public policy, law, health policy, economics, or management. The council also consists of five nonvoting members or their designees—the HHS secretary, the NIH director, the NIDA director, the chief medical director of the Department of Veterans Affairs, and the assistant secretary of Defense for Health Affairs. For more information, visit www.drugabuse.gov/about-nida/advisory-boards-groups/national-advisory-council-drug-abuse-nacda. Preventing Drug Use among Children and Adolescents: A Research-Based Guide describes the most successful concepts for preventing drug use among young people. Principles of Drug Abuse Treatment for Criminal Justice Populations: A Research-Based Guide informs drug treatment programs in criminal justice settings. Principles of Adolescent Substance Use Disorder Treatment: A Research-Based Guide describes the many treatment approaches available to address the unique needs of teens with substance use disorders. Principles of Drug Addiction Treatment: A Research-Based Guide is intended for use in community and clinical settings. NIDA DrugFacts is a series of plain-language fact sheets highlighting specific drugs, trends in use, and prevention and treatment issues. Most are also available in Spanish. NIDA Research Reports are online reports summarizing and simplifying current research findings for the educated lay public, legislators, educational groups, and practitioners. Some reports are also available in Spanish. Seeking Drug Abuse Treatment: Know What to Ask distills NIDA’s evidence-based treatment principles into easy-to-understand language. It offers families guidance while seeking substance use disorder treatment and lists five questions to ask when searching for a treatment program. Drugs, Brains, and Behavior: The Science of Addiction is a plain-language booklet that discusses the reasons why people take drugs, why some people become addicted while others do not, how drugs work in the brain, and how addiction can be prevented and treated. Family Checkup is an evidence-based resource that equips parents with research-based skills to help keep their children drug-free. Easy-to-Read Drug Facts website, developed with adult literacy educators, provides plain-language information about different drugs, addiction, prevention, treatment, and recovery. Most pages are available in Spanish. NIDA TV is a central location for all NIDA videos and public service announcements. NIDA for Teens: The Science Behind Drug Abuse is an interactive website, focused on preteens and teens, that includes information about various addictive drugs and their consequences, as well as resources for parents and teachers. Marijuana: Facts for Teens and Marijuana: Facts Parents Need to Know are two of NIDA’s most popular publications, which provide information on the short- and long-term effects of marijuana. The Mind Matters series targets middle schoolers and highlights the effects of drugs on the brain and encourages the study of science. 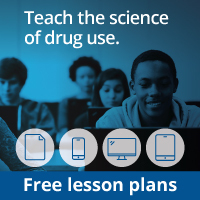 NIDA teams with Scholastic, a leading provider of educational materials for children and teachers, to create ongoing science-based information about drug use, seen in at least half of all U.S. classrooms. To see what publications are available free, in hard copy, contact DrugPubs, NIDA’s Research Dissemination Center, at the website above or by calling 1-877-NIDA-NIH (1-877-643-2644). National Drug & Alcohol Facts Week® (NDAFW), a health observance week at the end of January, connects teens with experts to shatter the myths about drugs and alcohol, with more than 2000 local events every year. National Drugs & Alcohol Chat Day, held during NDAFW, provides an online opportunity for thousands of students from around the country to communicate directly with NIDA scientists in a Web Chat, asking questions about drugs and alcohol. Addiction is an Emmy Award–winning HBO documentary produced in collaboration with NIDA, the Robert Wood Johnson Foundation, and the National Institute on Alcohol Abuse and Alcoholism. The film explores drug and alcohol addiction through the eyes of those who suffer from this devastating disorder, with the added perspective of scientific and clinical experts working to better understand and treat it. Resources for Clinicians: NIDAMED’s Web portal offers science-based information for clinicians related to drug misuse and addiction, including videos and links to guidelines, continuing medical education resources, and other recommendations. Screening Tools: NIDAMED provides tools and resources clinicians can use to screen patients for tobacco, alcohol, and illicit drug use. Medical School Curricula: NIDA’s Centers of Excellence for Physician Information program provides scientifically accurate information on substance use, addiction, and its consequences to help meet the educational needs of medical students, residents, and medical school faculty. For more information visit drugabuse.gov/nidamed-medical-health-professionals/centers-excellence-coe-physician-information. All NIDAMED resources can be found at drugabuse.gov/nidamed-medical-health-professionals. Addiction Science Awards—coordinated by NIDA—are given annually to three exemplary projects at the Intel International Science and Engineering Fair, the world’s largest high school science competition. CTN Dissemination Initiative—coordinated by NIDA’s Clinical Trials Network—disseminates user-friendly treatment tools and products into front-line clinical settings. The initiative is comprised of three components: products and materials, meetings and conferences, and collaborative partnerships.